Today we had a visit from Dana, the organizer of some pretty fabulous students from Uranium City. She came with a cheque from their fundraising activities. We first heard from Dana last fall when she called looking for a volunteer opportunity for the students while they were in town for WE Day in Nov 2014. The students had been fundraising to pay for their own flights from the northern Saskatchewan community, located 835km north of Saskatoon, to attend the free event that encourages youth to volunteer in their community and around the world. Dana and the students came to the Friendship Inn on the Saturday following WE Day and helped out with preparing and serving the lunch meal. Since WE Day the group of 6 students have been fundraising in lots of different ways around the community of about 80 people. They have been doing car washes, spaghetti suppers for workers connected to mining in the community, a Valentines’ lunch auction and bake sales. 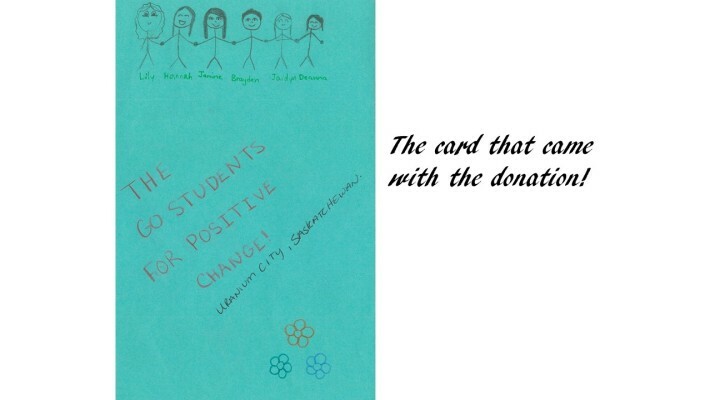 These kids are creative and hardworking and encouraging generosity in their community. The cheque they brought us was for over $4500, that’s enough to sponsor a day at the Inn!